Location: Granite Gap, Hidalgo Co., New Mexico, USA. Scale: Specimen Size 2x2.5 cm. Comments: B&W image of a druse of yakovenchukite-(Y) crystals in a void within sodalite-aegirine-microcline veinlet in ijoliteurtite. (AmMin v92:1527). Location: Mt. Kukisvumchorr (Khibiny Massif), Russia. Scale: Picture size 3.0 x 2.4 mm. Comments: Gray-blue waxy yanomamite coatings on quartz. Location: Mangabeira Tin Deposit, Goias, Brazil. Scale: See Photo. Comments: Blue-black metallic granular spionkopite, intermixed with yarrowite altering, with quartz. Location: Yarrow Creek, Alberta, Canada. Scale: See Photo. Comments: Blue-gray metallic yarrowite grains in granular quartz rock with spionkopite. Comments: Translucent pale pinkish-tan colored crystal fragments. Location: United Verde Mine, Jerome, Verde District, Black Hills (Black Hill Range), Yavapai Co., Arizona, USA. Scale: Fragment Size 1 mm. Comments: BSE image of willemite (Wil), unaltered yeatmanite (Yeat) and alteration phase (Alt). Location: Garpenberg Norra mine in Dalarna County, Sweden. (CanMin, v41:201). Scale: See Image. Comments: Tan to reddish brown resinous yecoraite coatings on quartz. Location: Marie Elena Mine, Yecora, Sonora, Mexico. Scale: See Photo. Comments: Ye'elimite and hydroxylellestadite intimately intergrown as a brownish aggregate in massive anhydrite. Comments: Thin coating of yellow yingjiangite on matrix. Location: Kladaske Mine, Erzgeborge, Czech Republi. Scale: Picture size 1.5 cm. Comments: Dark bluish-black prismatic yoderite in quartz. Location: Mautia Hill, Dodoma, Tanzania. Scale: See Photo. Comments: Translucent, brown yoshimuraite microcrystal. Location: Toguchi Mine, Shidara, Kitashidara-Gun, Aichi, Japan. Scale: See Photo. Location: At a distance of about 224 m from their Apollo 14 lunar lander, in the bottom of a 30-cm-deep trench, Mitchell and Shepard collected the two-gram rock that is regolith breccia 14076. Scale: Scale Bar 50 µm. 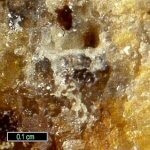 Comments: Fragment of the large grain of compact mustard-yellow yttrobetafite-(Y) from the type locality. Associated minerals are black biotite and redish-brown veinlets of gummite. Location: Alakurtti pegmatite, Northern Karelia, Murmanskaja Oblast', Northern Region, Russia. Scale: Specimen size is 4.5x2.8x1.4 cm.